The principal route for the degradation of fatty acids to acetyl CoA. In β-oxidation, carbons are removed from the fatty acid chain two at a time; thus one molecule of acetyl CoA is formed on every turn of the spiral of β-oxidation (see diagram). 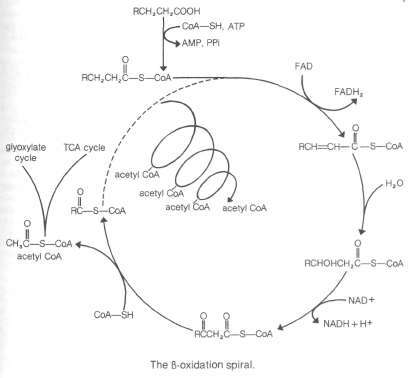 The acetyl CoA resulting from this process can be further oxidized in the TCA cycle to yield more energy or it can be converted to sugar via the *glyoxylate cycle. In germinating oil-rich seeds the enzymes of β-oxidation are located in the glyoxysome along with the enzymes of the glyoxylate cycle.